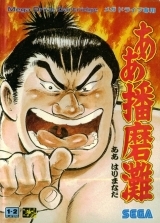 Chose rare, il s'agit ici d'un jeu de sumo, sport traditionnel du Japon, et basé sur le manga éponyme. 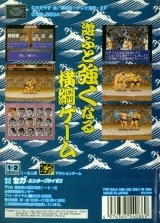 At the password screen, press 2 times and enter the Japanese character. 4 times and enter the Japanese character. 3 times, 1 time and enter the Japanese character. Enter a !. 6 times, 2 times and enter the Japanese character. 1 time and enter the Japanese character. 2 times, 1 time and enter the Japanese character. 2 times, 3 times and enter the Japanese character. Enter !!. Now hit End to go to the last day of the tournament. At the password screen, press 3 times and enter the Japanese character. 3 times, 1 time and enter the Japanese character. 2 times, 3 times and enter the Japanese character. 2 times, 2 times and enter the Japanese character. 2 times, 1 time and enter the Japanese character. 5 times, 1 time and enter the Japanese character. 7 times and enter the Japanese character. 7 times and enter the Japanese character. Now hit End to watch a special funny scene. At the password screen, press 3 times and enter the Japanese character. 2 times, 3 times and enter the Japanese character. 4 times, 1 time and enter the Japanese character. 3 times, 1 time and enter the Japanese character. 3 times, 1 time and enter the Japanese character. 5 times, 1 time and enter the Japanese character. Now hit End to be able to see every cutscene. At the password screen, press 1 time and enter the Japanese character. 7 times, 2 times and enter the Japanese character. 5 times, 2 times and enter the Japanese character. 4 times and enter the Japanese character. 1 time, 1 time and enter the Japanese character. 5 times, 1 time and enter the Japanese character. 3 times, 1 time and enter the Japanese character. Now hit End to play the minigame.